Before reading this fact sheet please note that this document is intended only as a fact sheet for leather garments and is in no way a cleaning or care instructions for leather and suede products. No responsibility is taken by Excels UK Limited for any improper use of this guide resulting in garment damage. There are many types of leathers used for garments. Some of these are sheepskins, suede, grain leather and chamois leather. A Wide range of leather products ensures that the consumers have a varied choice of inexpensive garments. However unlike other fabric garments, suede and leather products can not be cleaned using standard cleaning methods. Leather products can not be washed in water or dry cleaned in solvents in the same way as fabrics can and thus a specialist cleaning facility is required. Therefore it is essential that in the even of a garment becoming highly soiled cleaning is not attempted at home. It is important to ensure that if garment become wet then they are allowed to dry naturally. Here is a simple care guide. If a garment is stained, do not attempt to remove stain yourself. Take garment to a profession leather dry cleaner. Do not let garments become heavily soiled before having them cleaned. Similar or matching garments (matching jacket and trousers) should be cleaned at the same time to ensure consistency in colour. You should be prepared for variance in depth of colour after cleaning. This may be due to the garment being made originally from skins of different animals which react differently to cleaning solvents. Masking materials are used on leather garments during manufacture to hide imperfections in skins such as bite marks. Be prepared for some of this masking to be removed in cleaning process. Furthermore manufactures use skin of different animal for garment make up and in cleaning process this difference can occasionally be accentuated. 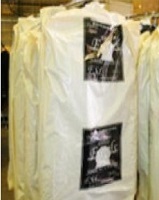 Be aware of dry cleaning adhesives which are used during manufacture to glue linings etc. Some of these adhesives dissolve in dry cleaning solvents, seeping through to outer surface to leave dark shaded areas. Please download a printable copy of our fact sheet here.